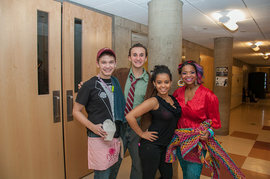 IC Backstage: Behind the Scenes with "Legally Blonde"
1/25/2013Share this story on Facebook! Learn more about the musicals, plays, and operas that Ithaca College Main Stage Theater puts on every year. “I very clearly remember telling my mom, 'Mom… I really want this one,'” he says. DePietro, like every other BFA musical theatre or acting major at IC, was required to audition for the Ithaca Main Stage Theater production, but he was especially excited for this show. The musical production of Legally Blonde is an adaptation of the 2001 movie starring Reese Witherspoon. The play tells the story of Elle Woods, an energetic Southern California sorority girl who is in love with her boyfriend, Warner Huntington III. Warner unexpectedly dumps her for not being “serious” enough. Heartbroken and determined to win him back, Elle follows him to Harvard Law School, befriends a manicurist and learns a lot about herself in the process. With the movie being such an accessible research tool, developing original characters often proved challenging for performers. Senior musical theatre majors Chloe Tiso and Megan Ort were both cast as the lead, Elle Woods. They alternated performances throughout the week. It was easy to have fun with a cast and crew of close friends. Six of the students involved in the play live together. “We sometimes joke that we can put on a mini-version of the show in our living room,” DePietro says. The real production, however, was anything but small. With moving sets, trained dogs and original choreography, the process wasn’t without its challenges. One of the greatest lessons the actors learned throughout the process came from the show’s message, hidden under all the pink and glitz.